Angelo M. Russo of Chicago has joined the Special Olympics Illinois Board of Directors and will serve on the Marketing & Development Committee. Russo is currently a partner at McGuire Woods working in commercial litigation with an emphasis in antitrust and unfair competition issues. He has also worked with both defendants and plaintiffs on cases comprising international cartels, price fixing, territorial and customer allocations, tying arrangements, exclusive dealing contracts, bundled discounts, monopolization, and unfair and deceptive trade prices. Russo has worked in the life sciences, healthcare and transportation industries. He has also drafted and implemented national and international antitrust compliance programs and audits. In May 2010 Russo and his team at McGuire Woods successfully won a case on behalf of Jo Tankers before the U.S. Supreme Court. Russo is vice chair of the Business Torts and civil RICO committee of the American Bar Association. He also serves as the Young Lawyer representative to the Corporate Counseling Committee of the ABA Antitrust Section and is an active member of the firm’s Recruiting Committee. From 2009-2010, he was chairman of the Chicago Bar Association’s Antitrust Law Committee. 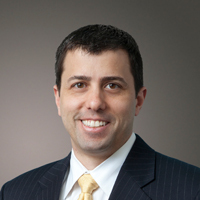 Russo is a fellow in the Litigation Counsel of America Trial Honor Society and has been named an Illinois “Rising Star” by Illinois Super Lawyers for the past five years. He received his bachelor’s degree in psychology from the University of Illinois at Urbana-Champaign in 1997 and graduated from the College of Law at DePaul University with honors in 2000.